Decision points and intervention opportunities regarding a patient’s drug therapy can vary over the lifetime of a claim and per individual patient. 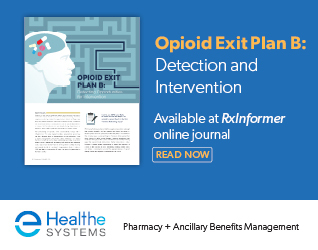 Up front, basic interventions such as having a drug formulary in place can put a claim on the right path from the start, while well-established and more complex claims might require more strategic clinical consultation. But the decision points that trigger these interventions are influenced as much by the healthcare landscape as they are by claim longevity or individual patient characteristics. And in a changing healthcare landscape, new intervention triggers must be continually explored and tested. New regulations, new drugs entering the market, and new guidelines – most notably the recent launch of the CDC Guideline for Prescribing Opioids for Chronic Pain – all present novel opportunities to impact care. Take, for example, the introduction of opioid antidotes to the market. Evzio®, an auto-injection formulation of the opioid overdose reversal agent naloxone, was first approved in April 2014 and launched later that year. Narcan™, the first FDA-approved nasal spray formulation of naloxone, also launched earlier this year. Both products have the potential to impact workers’ comp. Either of these products may be prescribed if the physician feels their patient is at risk of opioid overdose. And while a one-time prescription of Evzio or Narcan in a claim should not immediately confer that the patient is struggling with addiction or misuse, the claims professional is now faced with a decision point upon which he or she can act: the presence of either of these products in a claim warrants in-depth evaluation of the current opioid treatment plan. If a patient is at a risk level that necessitates prescribing of an opioid antidote, perhaps the continued appropriateness of opioid therapy should be reconsidered. There is now an opportunity to intervene with the prescriber and ask the question – Is an opioid the best choice for this particular patient? Until the past year or so, the Evzio decision point did not previously exist. And it continues to evolve – the CDC guideline now recommends offering naloxone to patients with risk factors that include a history of overdose or substance use disorder, concurrent benzodiazepine use, and perhaps most notably, a daily morphine equivalent dose (MED) of 50mg or higher – a highly inclusive criterion that impacts a large segment of the injured worker population and could significantly increase naloxone prescribing. Evzio prescribing is just one example (though a very significant example) of a new scenario that payers must be equipped to handle. New or evolving decision points present themselves every week, every day – and unless they are being continually evaluated, payers won’t be able to keep ahead of them. New decision points should trigger the development of new strategies for managing drug therapy – otherwise you’re just tracking trends and not influencing them. For this there is truly no one-size-fits-all approach. Is it a new injury, or a well-established and more complex claim? Is it a decision point that warrants a more clinically experienced decision-maker? These are examples of questions that must be addressed in order to make a particular decision for a particular claim or set of claims. Decision points are only valuable if claims staff can act on them, and clinical decision support and automated tools that put recommendations in front of the most appropriate decision-makers are part of this answer. Program flexibility is another component of that answer. Successful management means having the agility to manage the different and changing needs within a population, as well as the individual patient. This applies not only to patient characteristics, such as geography or industry, but also to the different decision points along the care continuum. Continuous evaluation of decision points paired with program flexibility will provide the greatest opportunity to improve clinical outcomes and greater opportunities for cost savings. Healthesystems reports on a number of trends that are creating new decision points in workers’ compensation claims in their Summer 2016 issue of RxInformer journal. This is a sponsored post from WorkCompWire marketing partner Healthesystems.